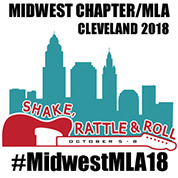 The Southern Chapter of MLA (SC/MLA) held its 68th Annual Meeting October 25–28, 2018. Members met at the Wyndham Hotel located adjacent to the Disney Springs area in Orlando/Lake Buena Vista, FL. The meeting opened with four half-day classes. Three classes were taught by our own SC/MLA members and covered data analysis, library marketing, and promotion of library events. The fourth, and most popular class, was provided by MLA President-Elect Julia Esparza, AHIP, and looked at clinical communication. Attendees at all the continuing education classes found them highly useful. Being so close to Disney meant that some mice crept in, and the Thursday night Welcome Reception featured visits from Minnie and Mickey Mouse. Twenty-seven excellent vendors were present, and a mix of Mediterranean dishes and Chinese stir fry was enjoyed by all. The theme for this year’s meeting was “Experience the Magic: Libraries of Tomorrow.” To accompany this theme, three invited speakers looked at areas of growing importance in libraries today. The first speaker was MLA President-Elect Esparza. Esparza rushed out of her own chapter’s meeting (nearly missing her South Central Chapter Librarian of the Year award!) to come and discuss what she saw in the future for libraries. During a well-researched talk, she discussed where we had come from to this point and then focused on the needs of clinicians, key trends in technology, and where librarians have roles to play. The second speaker, Shirley Zhao, Spencer S. Eccles Health Sciences Library, University of Utah–Salt Lake City, walked attendees through the basics of data management: what it is, how to get involved, and what you need to get started. The last speaker was Derrick Jefferson, American University, Washington, DC. Jefferson gave a moving talk on diversity and inclusion: where we are, what we can do, and how it felt to be on the outside fighting to get in. There was not a dry eye in the house, and everyone was reminded of the importance of continually moving to a more diverse and inclusive work place. A diverse mix of twenty-nine papers and thirty posters were presented at the meeting. Paper topics were grouped into five topic areas: evidence-based practice, curriculum, research, community and consumer health, and trends. Posters covered a variety of topics from the use of graphic medicine for teaching about death to systematic reviews to hospital benchmarking. A wonderful and tropical banquet was held on Saturday night to round out the meeting. Live music, line dancing, and a conga line (or two) were enjoyed by all. More information on the meeting—including archived papers, posters, and presentations—can be found SC/MLA website.